Again, thank you Jo and Virginia for testing this pattern. Round 6 edited 8/03/09, edits in red. This pattern is basically the same as the Butterfly Garden cap in my previous post, with the addition of a pony bead for the bodies of the butterlies. 2. When joining with a slip stitch, pull the slip stitch tight. 3. All sizes are made with the same pattern. The different yarns and hook sizes make it the different sizes. Yarns I used in developing this pattern: Woman’s Red Heart Super Saver, Tween/Teen’s Simply Soft, and Baby/Child’s Red Heart Sport. 4. 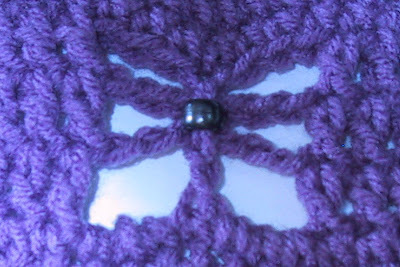 The stitch placing the bead is worked around both ch 6 loops.